It’s been a long time coming, and we have finally completed migrating the website and master server to a new instance hosted on AWS. We hope that performance and stability will be improved! There might be a few minor issues over the next few days until the DNS changes have fully propogated. Also, e-mail from the website is currently not working, but is expected to be restored soon. Update: Some performance related fixes have been implemented to address some issues with the new provider that were causing extended outages over the past week. Fingers crossed that the new configuration is good. Also, server stats are now re-enabled! SEC2 2.0.6 Beta 3 is now available for Both Windows and Linux Servers. Latest chances include contributions of [eAu]Phreeze, =MXT=Fred.cpp, [BoS]Jim and Vityacv. Latest SEC2 build is available for download, currently only for Windows. Linux build should be ready within some days. This update is only for servers. Players do no need to take any action at this moment. Major changes since 2.0.5 include speedhack and pickup detection, along with several log enhacements and cleanup. Full changelog will be available once we reach a final 2.0.6 version. 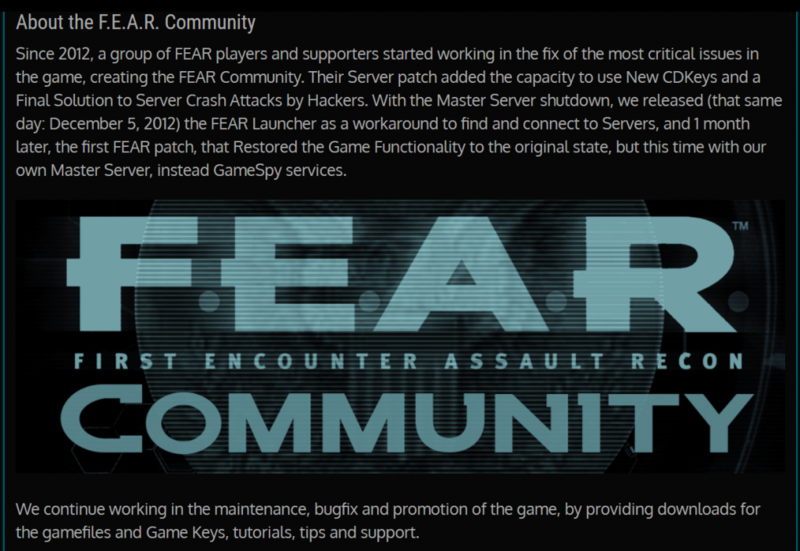 5 years ago, the worse news arrived to FEAR Combat: The FEAR Master server was Shut Down. Servers restarting couldn’t come back online. Players searching servers got no response. The FEAR Community team, by then moslty <eAu>Phreeze and me, =MXT=Fred.cpp were getting ready for this scenario for some time, but we were still not ready. This nightmare scenario, or like I use to call It, the Ultimate FEAR Fate Event, was previously predicted by Phreee to happen before 2012 end, we were not sure when. Maybe De 15th, we hoped. I was very optimistic, because I had the FEAR Combat Launcher almost ready, but with important features missing and had to work fast. He was already working on a new Master Server; something that exceded my wildest dreams, but I was condifent he could do “something”. When that 5/12/2012 day we lost the official master server, lot of people quit. They didn’t know we released, that night the FEAR Combat Launcher, that allowed people to connect to the still running servers. During the next days Phreeze, that already had made the SEC2 servers support both old and new CKeys, made SEC2 allow new servers to start, without the old master server. Finally only a month later, he released a Patch that allowed both client and servers go back to normal, making the FEAR Launcher not needed anymore. A huge task that I want to acknowledge today. Without It, It’s almost sure there would be no servers running. here is an extract of the about page of this site. Eventually, more people joined this effort. Thanks for continue with us, to all players, server admins and supporters. A full changelog will be provided later, but for now, mostly includes fixing exploits and bugs, as well as antihack meaures for the latest available hacks, specially those focused on crashing servers and kick out other players. As usual, we encourage server admins to update and provide feedback to avoid when possible, false positives and keep servers clean. Added: INVISIBLE_PLAYER_HACK fix (RODRIGUEZ Mode). Added: IMMORTAL_PLAYER_HACK new version fix. Fixed: False positives when picking up mines and remotes. Known issues: Some votes can cause false positives for VOTETYPE_HACK; we are researching his one. Added: SERVER_CRASH_HACK at login fixed (Thanks to Vityacv). Added: VOTETEAM_HACK detection, used to kick players with no need for other’s votes. Added: TEAMID_HACK Detection, for players switched to invalid Team. Added: DAMAGE_PLAYER_HACK and it’s variants detection. Changed: PICKUP_HACK logic and details on the type of pick up. Fixed: Exploit that allowed hackers to ban other players. Fixed: %s exploit that allowed to crash servers.